Security Marking & Nightclub Special Effects. 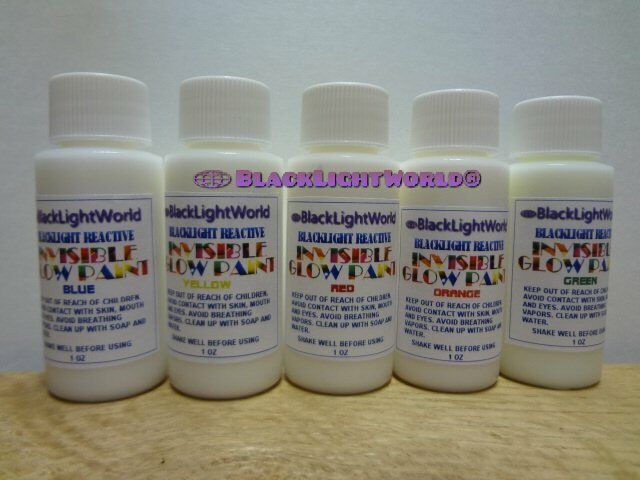 Totally Invisible, Requires genuine Black Light To See! Incandescent (FAKE) novelty bulbs or LED bulbs do not work. 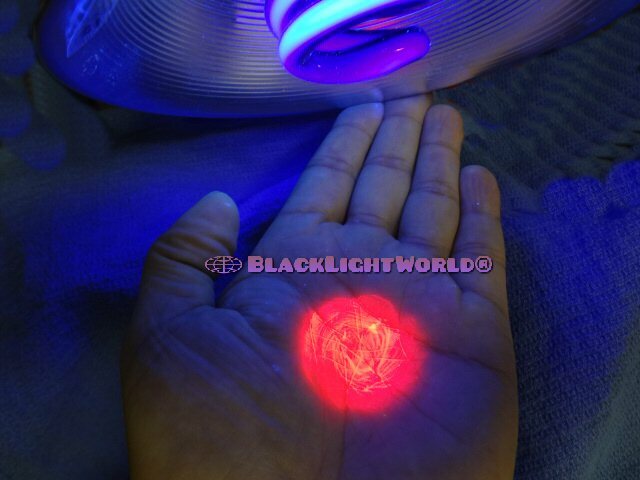 For optimum viewing these brilliant colors they require 350-360nm of long wave Black Light. We advise buyers to only use tube style Black Lights or CFL Black Light bulbs only ! Water Based Protective Coatings Purchased At Paint Stores Can Be Applied To Extend Life Of Paint. Dries hard on fabric. Works best with fine small lines or small design murals due to the fact that it creates a stiff texture to the fabric. DO NOT USE THIS INCANDESCENT BULB WITH OUR INVISIBLE PAINT. 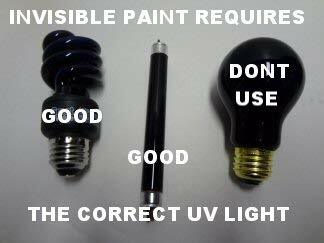 ITS A PARTY BULB WHICH DOES NOT EMIT CORRECT BLACK LIGHT OUTPUT FOR USE IN VIEWING OUR INVISIBLE PAINT! 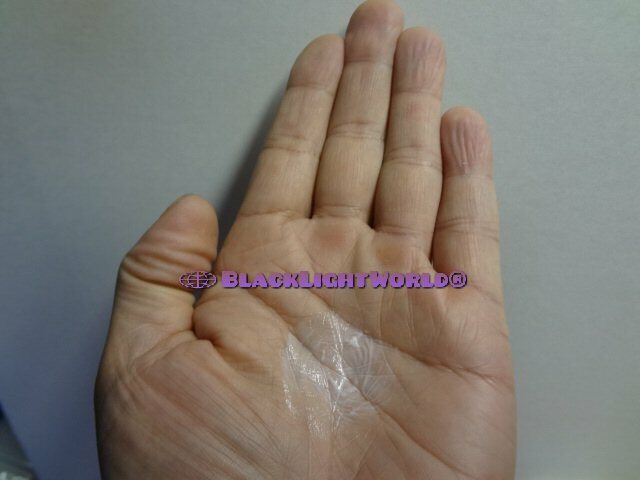 INVISIBLE PAINT CAN NOT BE USED WITH LED STYLE LIGHTING ALSO! Green is greenish/yellow NOT DARK GREEN! 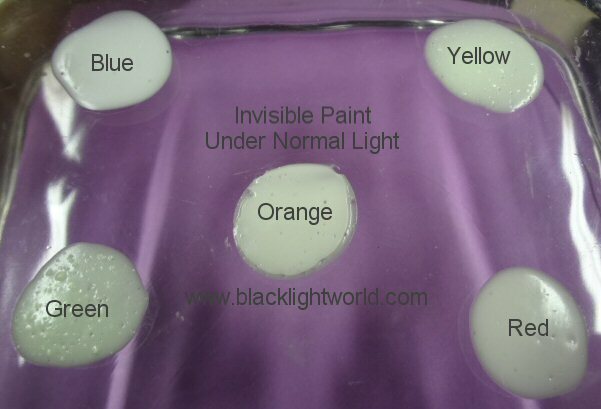 Yellow has slight green over tones which is common with Invisible Paint. All paint are non refundable. RIGHT: WET PAINT DROPS WITH NATURAL LIGHT. ACTUAL PAINTING WILL DRY CLEAR & INVISIBLE USING LIGHT PAINT STROKES. MATTE FINISH. WASHABLE & DURABLE. OUTSIDE OR INDOOR USE WE RECOMMEND A WATER BASED CLEAR POLYURETHANE COAT. ANY PROTECTIVE CLEAR COAT WILL WORK TO PROTECT PAINT LIFE. WITH SO MANY PRODUCTS TO USE AS AN OVER COAT ITS UP TO THE USER TO EXPERIMENT WITH SMALL AREAS FOR FULL SATISFACTION OF OUR INVISIBLE PAINT. 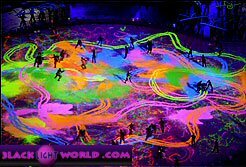 Black Light Worlds totally invisible black light reactive paint display brilliant effects on almost any surface. Finish is totally invisible using light coats. 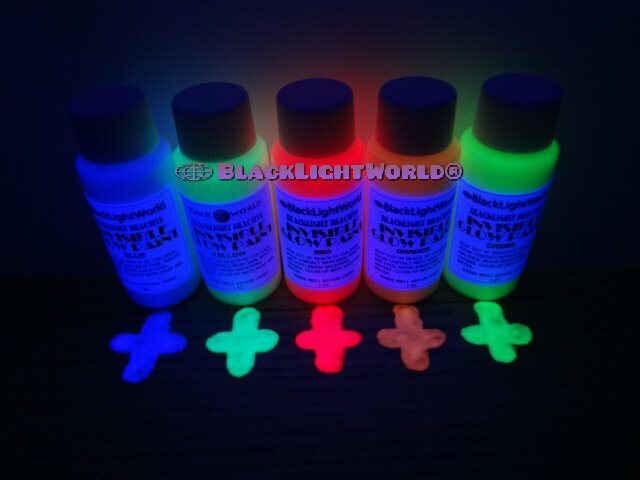 Our Black Light Paint is water based for easy clean up, & will dry hard within 90 minutes. Great for theatrical effects, night clubs, computer mod designing, identification marking, floor designs, wall designs and an endless list of possibilities. We only offer our paint currently in a Clear Latex matte Finish. 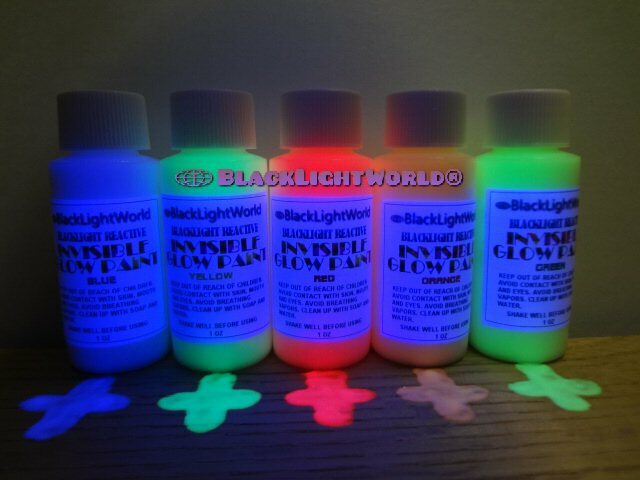 Only the finest pigments have been used and heavily saturated to produce nothing but the best in brilliant black light effects. DO NOT APPLY WITH A PAINT ROLLER AS CERTAIN TYPES ATTRACT PIGMENTS AND CAUSE ADVERSE STREAKING EFFECTS!